Today's despatch from the MARVEL UK time distortion involves their other giant robots: ZOIDS. The Tomy-created toys first appeared across the Marvel weeklies and monthlies in January 1985 in a four-page insert in SPIDER-MAN 620, INDIANA JONES MONTHLY 5 and RETURN OF THE JEDI 84. By bizarre luck, I acquired a back issue of INDIANA JONES with the original Marvel paperwork still attached (it must have been - at some point - a Marvel file copy) and I posted that here. All concerned obviously deemed it a success as the experiment was repeated, with a second three-page self-contained story (the fourth page was always a guide to the toys) in September, by which time there had been several changes to the line. MARVEL SUPER HEROES SECRET WARS had launched, the (gasping) Spider-man weekly was now labouring under the name SPIDEY COMIC and Indy's monthly had closed. The second insert appeared in SECRET WARS 12, SPIDEY COMIC 653 (where, in a further sign of desperation and curtailed budgets, panels were also used as the issue's cover) and RETURN OF THE JEDI 117. Both of the one-shots focused on the mysterious being known as the Namer, an alien dweller of the planet Zoidstar whose main purpose, other than to wander the desert-like surface in a morose fashion, seemed to be to name the various giant warring mechanical creatures who roamed the surface. The basic premise of the Zoids is that they were giant alien war machines, controlled by android pilots, which were divided into two opposing forces: the Blue (good) and Red (bad) factions. They then spent their days blowing each other to kingdom-come in a holdover from an ancient war. Presumably everyone was pleased with the two pilot instalments, and Marvel were keen to have an advertiser-funded strip on the books, as a regular feature was added to the pages of SECRET WARS from the 19th issue (9 November 1985). The debut coincided with the beginning of the new 24-page, full-colour format (a standard for the weeklies, beginning with THE GET ALONG GANG, during this period). To broaden the format of the strip, and create characters that readers might actually care about, the first episode introduced the surviving crew and convicts from a prison ship that, following a collision, is space-wrecked on the surface. The Namer quickly turns up to befriend them and bring them up-to-speed on the mechanical creations they encounter. After a limited run (issues 19-26) through to the end of the year (all reprinted in the first COLLECTED COMICS, below), Marvel put the strip on hiatus whilst it prepared its new home: the rebooted SPIDER-MAN AND ZOIDS, launched in March '86. 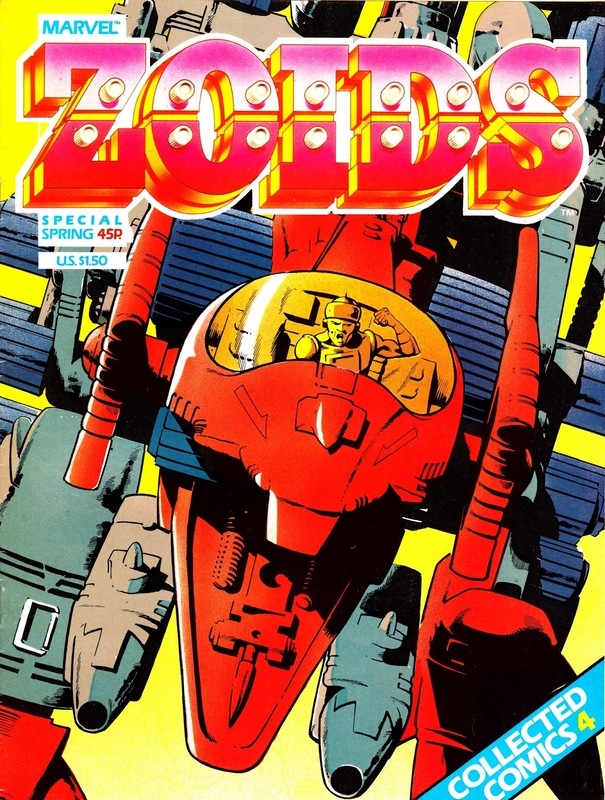 As the only UK-originated strip in an otherwise all-reprint title, the Zoids strip was the star attraction throughout the weekly's year-long run. 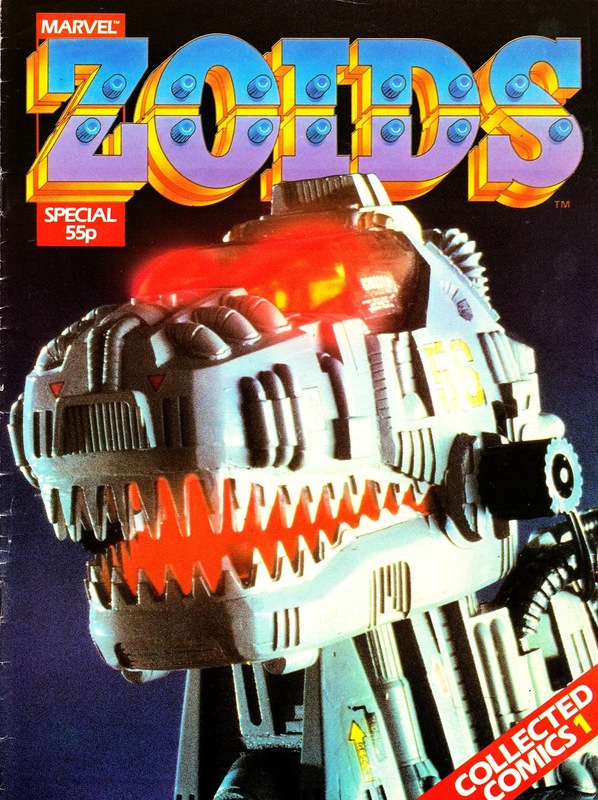 So much so that M-UK hatched plans to launch a Zoids solo monthly in the US format. With the strip moving on again, Marvel announced that Spidey would be unable to support a title by himself (!) and, for the first time since 1972, Marvel's corporate mascot didn't have a regular slot in a British title. That situation - incredibly - remained until the launch of THE COMPLETE SPIDER-MAN in late 1990. Unfortunately, for reasons not entirely clear (licensing problems? a sudden drop in sales? retailer resistance? a lack of interest from the States? ), the new launch was abandoned at the last minute (although that didn't entirely end Marvel's association with the warrior machines). 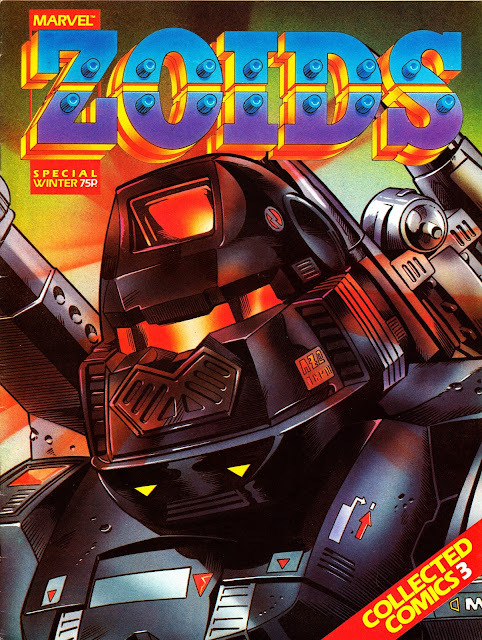 The ZOIDS COLLECTED COMICS, in addition to allowing Marvel to run the same strips again to double their bang-for-their-buck, initially allowed SM&Z readers to catch-up with the story so far by compiling the SW instalments into one issue. Three more specials followed, drawing on material from the early issues of SM&Z. Unfortunately, the demise of the planned monthly also killed the CC after the fourth edition, leaving the bulk of the strips (including some penned by Grant Morrison) only available in back issues of the weekly. The strip, which had a rotating creative team, is well worth seeking out as it becomes much more creative than its thin premise would suggest. In retrospect, its obvious that the creative team were liberally borrowing ideas from a number of certificate 18 movies (ALIENS and THE TERMINATOR spring immediately to mind) and reworking them for an audience that would be largely unaware of the source material. These are, to date (and - lets be honest - I doubt that will ever change), the only reprints of the strip on either side of the Atlantic. Which is a great shame. 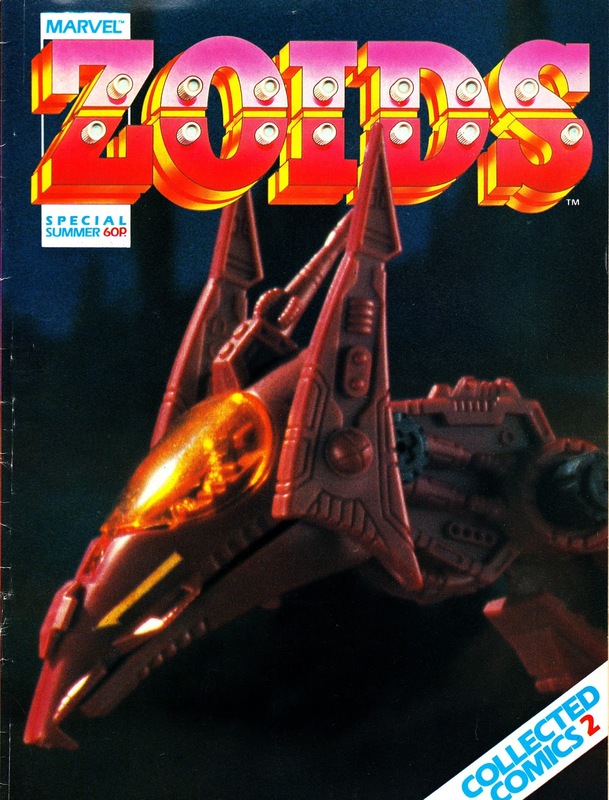 M-UK also published a rather nice ZOIDS ANNUAL around this time. I've also seen, in ebay, a second volume (which appears to reuse the cover from SM&Z 21). It sold for a crazy high amount but - frankly - I'm a little dubious of its authenticity. I've never seen it plugged in the comics nor mentioned anywhere else on line or in print. Buyer beware... unless you know otherwise! its almost unthinkable now that both the star wars and spiderman titles were both cancelled. 1987-1990 were truly the wilderness years for m-uk. i wonder if the current clone wars comic will be affected by the axing of the show itself..? Lastly just a quick word of thanks for the heads up on the those recent collected volumes from m-uk. i would never have even looked for them if you hadnt told us they were on sale. the hulk volume is amazing..it even reprints posters from the spiderman weekly. The ZOIDS POSTER MAGS passed me by completely at the time although I stumbled across one years later and I'll get around to posting that at some point. They're intriguing as they show that not only the toys continued but so did Marvel's promotional tie-in (albeit, judging from the copy I have, pretty dumbed-down) with Tomy. The demise of STAR WARS really wasn't much of a surprise. It was pretty dead in terms of interest at that point. A dearth of new movies meant that interest had waned considerably. It was noticeable that, for the last year-or-so, RETURN OF THE JEDI weekly seemed to be chasing a younger readership (almost certainly reflecting the general state of the industry at the time) even if the concurrent US strips (which, when they dropped to bimonthly, alternated with pre-JEDI reprints) weren't. I imagine that helped inform Marvel's decision to abandon the US strips entirely in favour of another outing of the ROTJ adaptation over the final months. I'm slightly surprised that M-UK didn't add the Star Comics DROIDS and EWOKS reprints to ROTJ but they were diverted elsewhere (SPIDEY COMIC and - eventually - THE MARVEL BUMPER COMIC respectively). All Star Wars merchandise was withering on the vine at that point... the action figures were also shutting up shop at this point. I'd bailed on ROTJ weekly as well (I was buying the last few issues of the US book from comic book stores and POWER PACK's US edition from my local newsagent) but I did feel a pang of nostalgia when I heard it was cancelled and came back for the last issue. I imagine that the current CLONE WARS comic will shutter - in favour of the new series - at some point. Incidentally, it suddenly dawned on me the other day that I hadn't spotted a copy of Titan's STAR WARS GALAXY COLLECTORS' EDITION comic in WH Smith for a while. Has it been cancelled? It was a pleasure to post about the various recent volumes of M-UK stuff. I'll make a point of doing more of it in the future. With luck, the revival of the M-UK GENESIS 92 characters next year will spark some sort of (belated) interest in the original strips. Thank you sir, that's very kind. Be sure to spread the word! It's a shame to hear about STAR WARS GALAXY. I bought the earliest issues but I didn't stick around. I guess SW has hit another between-movies lull whilst everyone gears up for the new movies. I guess Titan - assuming they manage to hold onto the license for magazines and comics - will launch something new to coincide with the new movies and TV show. I recall they launched a new comic to coincide with the first of the new STAR TREK movies but that seemed to vanish after only a few issues. Mind you, the tie-in action figures turned-up in POUNDLAND (along with some rather nice character drinking glasses) soon after the film did the rounds which suggests the merchandise - generally - wasn't a great seller.